Mothers’ Day is right around the corner; Sunday May 13th to be specific. For all of you who have a mother or a mother figure who you love, look up to and appreciate; or any other mother you know who is simply wonderful, you should most definitely get her a Mothers’ Day gift. Show her how much you really appreciate her. Now I know that sometimes there are so many options out there that it is often hard to make a choice for a gift. Here is a list of our top ten ideas for gifts you can get that special lady. If you want to keep it simple and classic, you can get her a lovely bouquet of flowers and a box of chocolates. She will feel very special and appreciated. There are numerous flower shops and stands in Nairobi where flowers are sold in all types and price ranges. You can get her daisies or lilies if you want the bouquet to be unique. Pink roses would also be a very wonderful pick as well. If your mum loves scented candles or any kind of aromatherapy like my mum does, this is a splendid gift idea. Scented candles are very much available in major supermarkets or gift shops. I have to say that my personal favorite is the Nakumatt Junction selection, it is superb. Make sure you know which scent she prefers then purchase a set of candles, or even just one large scented candle for her. Have it gift wrapped or put in a gift bag with a card and you have a very thoughtful gift ready. and you can go the extra mile and have it engraved for her. It makes for a special gift which she will appreciate and never forget. 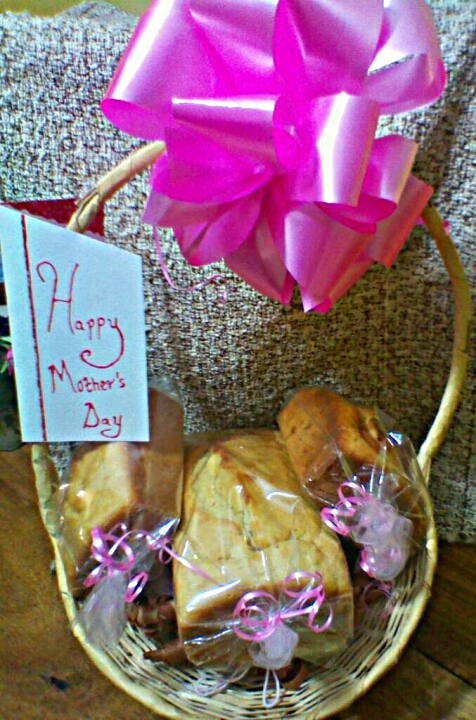 Of course you could also get your mum one of our lovely fruit bread gift baskets! 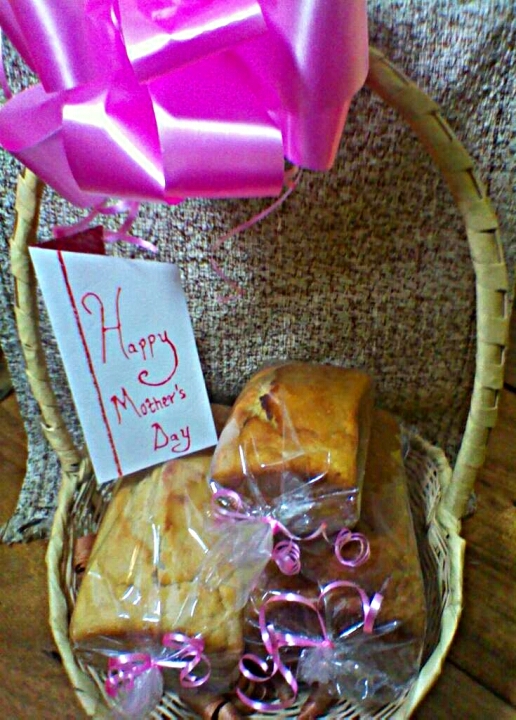 A bread gift basket is a great idea to get her so she can indulge her sweet tooth with our delicious fruit breads. It has a selection of each of our sweet and moist fruit breads; Banana, Orange and Lemon breads. It comes in two sizes; Small and medium size. She will absolutely love you for it ^_^! Get her one today! Another great gift basket idea is a fruit gift basket. Get her a selection of her favorite fruits and she will feel truly appreciated. They are available in some supermarkets or green grocers. I have also spotted some being sold opposite The Nairobi Hospital, they always look very delicious! She will enjoy this healthy and thoughtful gift. Most ladies love and appreciate perfume, surely your mum is no exception. Perfume is a glamorous gift to get for her as well as very thoughtful. If you know which particular scent she prefers, get her a bottle of it and present her gift to her. Whenever she wears it, she will always think of you and that’s bonus mum points for you ^_^! Sometimes a lady needs to unwind at home after a long day. Get your mum a home spa treatment which she can relax with at home and she will truly love it. Most of the spa products are easily available in supermarkets or beauty stores. Have them gift-wrapped for her and you will be her No.1 for contributing to her peace of mind. A monogrammed mug is a simple yet thoughtful gift for that special mum in your life. Mums love relaxing in the morning or evening having a nice cup of tea. Get her a mug that she can use and always think of you while sipping her tea. Monogrammed ceramic mugs are available in most supermarkets or gift shops. 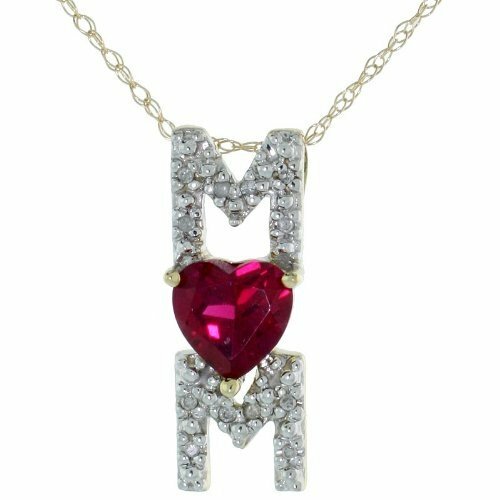 If possible get her one with a special “mum” message, she’ll love it! Treat your mum to a Spa package to one of her favorite spas, or any good spa you know of. There are several great spas in Nairobi; especially in the Westlands or Hurlingham area. They offer massage and spa packages which you can purchase for you mum to go to and relax. You can bet she will never forget her gift ^_^! Mums are very sentimental individuals. Get a picture of your family and have it blown up and framed in a beautiful frame. Have it gift-wrapped and when you present it to her; the look on her face will explain just how great your gift is. If you have a photo any size, you can just go to any quality photo studio and have it blown up to the size you would prefer. Then purchase a unique frame and voila! You have a gift ready. Make sure you get your mum or/and that special mother figure in you life something special to appreciate her this Mothers’ Day. Happy gift shopping ^_^! 8 Steps to a very Healthy Herbal Juice in Nairobi! nice advice Maureen.for the flowers.www.nairobicityflorists.kbo.co.ke oferrs it all .Am sure they will be more than glad to assist.